Are you sure it won’t happen here? Standardized testing is like “fun house” mirrors. Sure, they cast a “reflection” of the learner being tested, but it’s a grossly distorted reflection of who that student is as a learner or what they know or are capable of learning. Now imagine what it does to children’s sense of identity or self- worth as learners (as well as the self worth of the teachers) when such policies insist we make children “see” themselves through this distorted lens, and center their futures around that distorted information and how others will choose to see them. Annual testing has netted this result: public school students that sit before high school teachers in a large percentage of classrooms that are resistant to learning because they have acquired little basic foundation skills (were not tested, so were not emphasized) and have learned to skim text only to comply with testing parameters and time limits. Today, in these contemporary times, students are so turned off to active engagement in the learning process after being spoon fed benchmark instruction and test prep year after year, that they choose to cheat, borrow, and plagiarize to avoid straining their brains to engage in enough critical and creative thinking to arise at original ideas and responses. It is not their fault. In lieu of pedagogy that nurtures, enriches, and stimulates a desire to read, write, discuss, create original works, and learn information that gets stored in long term memory banks; we have turned to outcome based instruction in which far too often basic skills are ignored, carefully crafted schema or background information are not laid in the recesses of their long term memory banks, and standard approaches to test taking that are antithetical to authentic learning are taught in lieu of quality instruction that in most cases can’t be quantified. As a consequence, reading, thinking deeply, creating original ideas, and arising at original responses are a challenge to far too many, particularly those that have suffered under mandated”sanctions” that double down on the benchmark instruction and test prep. Moreover, students who seem like genuine intellects based on test scores and grade point averages, struggle to catch up on campuses from Ivy League institutions to the online colleges for profit because of the pedagogical neglect facilitated by state and federal legislation. Additionally, far too many students suffer a reproachful invalidation early in life that serves to govern much of what they do for the rest of their elementary and secondary school years. Some recover; far too many do not. Classroom teachers are daily witness to what goes on inside the classrooms because we are in them working with the students. We are the real experts, and we want to get back to creative and innovative teaching and learning that validates as opposed to invalidates. Outcome based instruction and annual testing have netted the same results year after year – no significant improvement in literacy, intellectual, civic, or creative prowess for public school students. We have come to realize over the course of more than fifteen years that constantly pushing outcome based instruction and annual testing is a costly waste of time and has done major harm to America’s public school students and their ability to love, appreciate, and engage in the learning process. Allow NAPE to do what it does, gather the data, and allow teachers to teach! As Sen Lamar Alexander and Patti Murray deliberate on the re-authorization of ESEA (aka No Child Left Behind) they claim this bill calls for a reduction in standardized testing and the elimination of federal oversight. And yet… if the standardized tests, like the fun house mirrors, are all distorted and inaccurate, then having fewer of them, controlled at the state level, changes nothing about the larger ideological assumption that standardized testing has any value. It doesn’t. So why have any? If you want an image that accurately reflects a person, you cannot use a distorted mirror to do that. Fewer tests are not more accurate tests, they are just fewer bad measurements. Additionally, the language of Alexander’s bill suggests that the states CAN add more testing beyond the stated grade-span tests if they so choose. 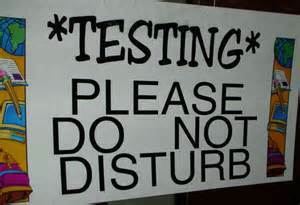 Given the corrupt partnerships between state legislators and governors and private corporate interests like Pearson, it’s a safe bet that state-level testing policy will more accurately serve their interests (profitable partnerships)than those of the students and teachers. Hogan recently stated, “We’re going to do everything we can to expand the use of charter schools. It’s a great idea.” Currently, local school systems bear the cost of charter schools, so approving them means increasing spending or cutting funds for existing schools. “I don’t see new schools being able to open,” said Kara Kerwin, president of the Center for Education Reform, a national charter school advocacy group that is pushing for Hogan’s bill to remain intact. Let’s take a look at Center for Education Reform. It’s funded by notable corporations and billionaires including the deadly reform triad: Gates, Broad and Walton. Hogan is creating a financial incentive: tax benefits of up to $200,000 for businesses that donate to private and public schools. National Alliance for Public Charter Schools ranked Maryland last among states with alternative school programs. Of course they did. ALEC cannot get his claws into MD unless they alter existing laws protecting public education from privatizers. Don’t look to Maryland Public Policy Institute for help. They tack on heavy layers of pro charter studies and reports to promote an ideology of privatization. Despite their desire to identify as “non partisan” we must note they received the 2006 Milton & Rose D. Friedman Foundation Innovation in Promoting School Choice Award. Their academic advisory board includes individuals who worked as senior research manager of the President’s Commission on Privatization, and two worked for the far right CATO institute. Where’s the non partisan piece of this? Jason Botel, founder of KIPP Baltimore and founding member of MDCAN also has a stake in colonization. MDCAN is also funded by Gates, Broad and Walton. Botel has been busy. He was part of a meeting in March 2015 hosted by The Association of Baltimore Area Grantmakers which “featured a rich discussion about ways that members of the philanthropic community might advocate for restoring funding for public schools.” A RICH discussion indeed. This should work swimmingly for corporation taking advantage of Hogan’s new tax incentive for private donations to fund charters. Also worth examining the list of 2012 Maryland Charter School Task Force members. Their “recommendations” rely heavily on research from the National Alliance for Public Charter Schools. So it’s not surprising how much their recommendation “mirror” ALEC model legislation. They are members of the ALEC education task force. Finally, it is critical that Marylanders and Baltimore City parents in particular understand the real reasons for the push behind the pro charter narrative. Read the “make money now!” description of a recent conference hosted by Baltimore based Camden Partners. Learn how to benefit from today’s huge industry shift, with so many education companies revising their business models. Understand why much of the industry is pursuing certification training for its huge cost benefit over degree programs. Discover which skill-based training programs are becoming commodities and which have pent-up demand. Recognize the ramifications of commercial textbook publishers and educational software vendors being eclipsed by new online players. Hear why companies providing resources and technical support for MOOCs are flourishing, and why the MOOC trend shows no sign of abating. Realize how game-based learning is finding its way into more and more K-12 classrooms, and why game designers are becoming part of the educational team. So major corporations and policy makers driven by an ideology of privatization are shaping the public narrative for education in Maryland. The connections between Hogan, the agenda to privatize public education and corporate interests run far deeper than what I have posted here. 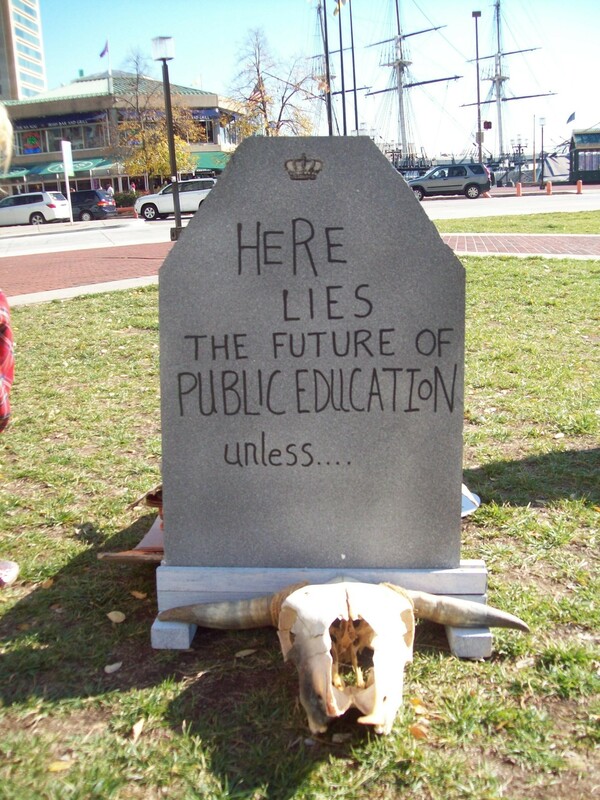 But unless the general voters, educators, and parents of Maryland are aware of how the narrative of public education, equity, and choice have been hijacked we will be stunned to awake one morning to find the fundamental core of our democracy: public education, has been sold out from under our feet. At some point, the blame must rest not with privatizers, but with ourselves for not doing anything to stop it. A young girl was trudging along a mountain path, trying to reach her grandmother’s house. It was bitter cold, and the wind cut like a knife. When she was within sight of her destination, she heard a rustle at her feet. Looking down, she saw a snake. Before she could move, the snake spoke to her. He said, “I am about to die. It is too cold for me up here, and I am freezing. There is no food in these mountains, and I am starving. “No,” replied the girl. “I know your kind. You are a rattlesnake. “No, no,” said the snake. “If you help me, you will be my best friend. The little girl sat down on a rock for a moment to rest and think things over. She looked at the beautiful markings on the snake and had to admit that it was the most beautiful snake she had ever seen. Suddenly, she said, “I believe you. I will save you. The little girl reached over, put the snake gently under her coat and proceeded toward her grandmother’s house. Within a moment, she felt a sharp pain in her side. The snake had bitten her. “How could you do this to me?” she cried. “You knew what I was when you picked me up,” hissed the snake as he slithered away. Yes, we all know that corporations “own” politicians and sway legislation. ALEC has gamed that system for decades. But what if that corporate-driven system of manipulating public governance “behind closed doors” to serve corporate interests could take it …one…step…further? What if there was an international TRIBUNAL of corporations that was able to TRUMP national governance, and enforce protection of corporate profits at the expense of human well-being? You’d have the Trans Pacific Partnership (TPP). I’ll take a giant leap here, as Don Bunger did (who alerted me first to this possibility) and suggest that Pearson (a corporation centered in the United Kingdom), the world’s largest producer of education tests and textbooks has its eye on (and hands in) the Trans Pacific Partnership. Pearson has enormous global power and reach. For example, if Uruguay can be penalized by Phillip Morris for creating an anti-smoking campaign what would stop Pearson from suing the United States for reducing (dare I hope….eliminating) standardized k-12 testing? The TPP agreement would give big corporations and Wall Street banks a way to eliminate any and all laws and regulations that get in the way of their profits. Let’s postulate for a moment that TPP (currently in its final phases of negotiations between the US, the EU, Mexico, Canada, Japan, Singapore and seven other countries) actually holds water (under public radar and in secrecy….which it is) and the testing refusal movement continues to grow in the United States. Just as we are nearing a tipping point and as states, one by one, are crafting legislation to roll back testing, we might foresee Pearson FORCING states to REVISE their legislation and SUE the United States into maintaining Pearson contracts for all testing. How can they do this? ALEC has crafted model legislation asking legislators to “fast track” TPP, see here. I am writing you to request a copy of the draft text of the Trans-Pacific Partnership (TPP) agreement. The TPP would be the most significant international commercial agreement since the World Trade Organization with broad implications for U.S. jobs, food safety, financial regulation, medicine prices and more. Corporate lobbying groups, including the U.S. Chamber of Commerce, and Republican leaders in Congress strongly support the deal, while congressional Democrats are overwhelmingly opposed. TPP’s backers say the final deal will boost economic growth, while critics argue that it could exacerbate income inequality and undermine key financial and environmental regulations. So if the “TPP investment chapter (can) grant multinational companies the political power to challenge domestic laws and regulations before an international tribunal” what would stop global Pearson from challenging anti-testing regulations? Yes. I know. Some of this may sound far-fetched. But then again, ten years ago if you had told me that children with severe physical and cognitive delays would forcefully have a pencil placed in their hands in order to take a test when they cannot even write their own name, that Pearson could and would spy on students Twitter accounts, and that teachers would be sentenced to 20 years in prison on “racketeering” for erasing bubble dots, I would have said that was all far-fetched too. Nothing that Pearson can or will do should be underestimated by us ever again. If you needed yet another reason to reject a test-driven system of public education…this might be it.